The contact parts are important components in switching devices. They have to maintain their function from the new state until the end of the functional life of the devices. they have to exhibit physical, mechanical, and chemical properties like high electrical and thermal conductivity, high hardness, high corrosion resistance, etc and besides this should have good mechanical workability, and also be suitable for good weld and brazing attachment to contact carriers. In addition they must be made from environmentally friendly materials. From this group silver has the greatest importance for switching devices in the higher energy technology. Other precious metals such as gold and platinum are only used in applications for the information technology in the form of thin surface layers. As a nonprecious metal tungsten is used for some special applications such as for example as automotive horn contacts. In some rarer cases pure copper is used but mainly paired to a silver-based contact material. Besides these few pure metals a larger number of alloy materials made by melt technology are available for the use as contacts. An alloy is characterized by the fact that its components are completely or partially soluble in each other in the solid state. Phase diagrams for multiple metal compositions show the number and type of the crystal structure as a function of the temperature and composition of the alloying components. They indicate the boundaries of liquid and solid phases and define the parameters of solidification. Alloying allows to improve the properties of one material at the cost of changing them for the second material. As an example, the hardness of a base metal may be increased while at the same time the electrical conductivity decreases with even small additions of the second alloying component. Composite materials are a material group whose properties are of great importance for electrical contacts that are used in switching devices for higher electrical currents. Those used in electrical contacts are heterogeneous materials composed of two or more uniformly dispersed components in which the largest volume portion consists of a metal. 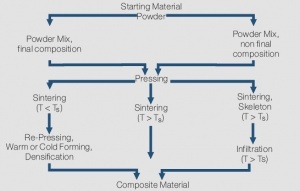 During sintering without a liquid phase (left side of schematic) the powder mix is first densified by pressing, then undergoes a heat treatment (sintering), and eventually is re-pressed again to further increase the density. The sintering atmosphere depends on the material components and later application; a vacuum is used for example for the low gas content material Cu/Cr. This process is used for individual contact parts and also termed press-sinterrepress (PSR). For materials with high silver content the starting point at pressing is most a larger block (or billet) which is then after sintering hot extruded into wire, rod, or strip form. The extrusion further increases the density of these composite materials and contributes to higher arc erosion resistance. Materials such as Ag/Ni, Ag/MeO, and Ag/C are typically produced by this process. Sintering with liquid phase has the advantage of shorter process times due to the accelerated diffusion and also results in near-theoretical densities of the composite material. To ensure the shape stability during the sintering process it is however necessary to limit the volume content of the liquid phase material. As opposed to the liquid phase sintering which has limited use for electrical contact manufacturing, the Infiltration process as shown on the right side of the schematic has a broad practical range of applications. In this process the powder of the higher melting component sometimes also as a powder mix with a small amount of the second material is pressed into parts and after sintering the porous skeleton is infiltrated with liquid metal of the second material. The filling up of the pores happens through capillary forces. This process reaches after the infiltration near-theoretical density without subsequent pressing and is widely used for Ag- and Cu-refractory contacts. For Ag/W or Ag/WC contacts, controlling the amount or excess on the bottom side of the contact of the infiltration metal Ag results in contact tips that can be easily attached to their carriers by resistance welding. For larger Cu/W contacts additional machining is often used to obtain the final shape of the contact component. Pure Gold is besides Platinum the chemically most stable of all precious metals. In its pure form it is not very suitable for use as a contact material in electromechanical devices because of its tendency to stick and cold-weld at even low contact forces. In addition it is not hard or strong enough to resist mechanical wear and exhibits high materials losses under electrical arcing loads. This limits its use in form of thin electroplated or vacuum deposited layers. The platinum group metals include the elements Pt, Pd, Rh, Ru, Ir, and Os Table 1. For electrical contacts platinum and palladium have practical significance as base alloy materials and ruthenium and iridium are used as alloying components. Pt and Pd have similar corrosion resistance as gold but because of their catalytical properties they tend to polymerize adsorbed organic vapors on contact surfaces. During frictional movement between contact surfaces the polymerized compounds known as “brown powder” are formed which can lead to significantly increase in contact resistance. Therefore Pt and Pd are typically used as alloys and not in their pure form for electrical contact applications. This page was last edited on 17 September 2014, at 21:18.